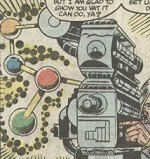 Affiliations: Unknowing tool of Xemnu the Titan; On the set of Mechagrub Meets Goddangit he employed Sid Brute as director, Ben Grimm (the Thing) as an actor, Mitchell as his personal assistant, and Warren as make-up; On the set of Monster Man he employed Simon Williams (Wonder Man) as lead actor. it's likely that Xemnu the Titan wasn't too impressed with Silverberg basing a TV show on him either! Base of Operations: "That Dadburned Studio" in Queens; Hollywood. Powers/Abilities: Ted Silverberg is a normal human being. He is an experienced motion picture and television producer. History: (Marvel Two-in-One#78 - BTS) - Ted Silverberg was the executive responsible for an impressive string of highly successful, if manifestly mediocre, TV series. 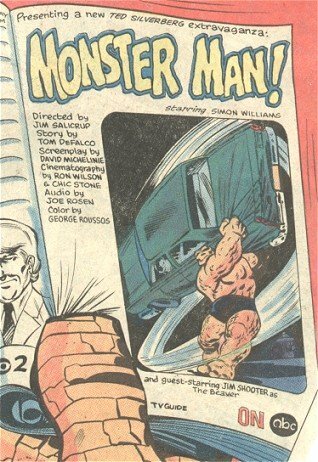 (Marvel Two-in-One#78) - At a studio in Queens, Silverberg was producing Monster Man (starring Simon Williams a.k.a. Wonder Man), an ABC television show loosely based on the likeness of the Thing. An unhappy Thing threatened the studio, but had no real recourse. 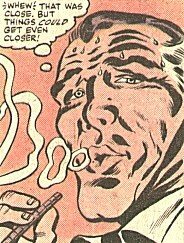 Simon Williams threatened to quit out of loyalty to his friend the Thing, but legally could not. Amos Moses, the creative genius behind Silverberg's shows, was revealed to be Xemnu the Titan, who was using the shows to control the minds of the populace. After the Thing and Wonder Man uncovered the truth and drove off Xemnu, Silverberg started anew with another show: The Xemnu the Titan Show! (Marvel Two-in-One#97 - BTS) - Silverberg was fired from network television, and returned to producing low-grade movies through his Silverberg Productions company. (Marvel Two-in-One#97) - After Silverberg finished filming on his newest movie, Sump Thing, he met with a Professor Frankheimer and purchased the rights to the gentleman's Holoflex Device. Bitter at the Thing's disruption of his successful television career, Silverberg hired the Thing to star in his latest film, Mechagrub Meets Goddangit with the intent of using the Holoflex Device to make a fool of the Thing. Though initially successful, the device overheated and inadvertently brought live dinosaurs to Hollywood. With the help of Iron Man, the Thing stopped the dinosaurs, though the Holoflex Device was destroyed in the fight. Tony Stark forced Silverberg to hand the embarrassing film over to the Thing. (Marvel Westerns: Outlaw Files - BTS) - Movie writer Ben Charles wrote a pitch on a Western movie called Gunhawks to producer Ted Silverberg as a buddy movie for Wesley Snipes (the entry just says Snipes). Monster Man, Kid Monstro, Captain Chlorophyll, the Lethal Legumes from Planet Twilo, and Ted Silverberg were created by Tom DeFalco, David Michelenie, Ron Wilson and Chic Stone. Sump Thing, Professor Frankheimer, and der Holoflex were created by David Michelenie, Ron Wilson, and Jon D'Agostino. Ted Silverberg is a loose parody of network television executive Fred Silverman, who actually had been in charge of programming at ABC for a while (where he revitalized the network with "jiggle TV" staples like Charlie's Angels). When MTIO 78 appeared he had moved to NBC and was nearing the end of his run in charge of programming there, where he'd green-lit such shows as BJ and the Bear and Supertrain. By the time MTIO 97 appeared, Silverman, like Silverberg, had left network television and formed his own production company, the Fred Silverman Company. The successful network TV Incredible Hulk show had been running for several years at the time MTIO#78 appeared, and was almost certainly in part the inspiration for Monster Man. Outlaw Files addition by Loki! anyone with a similar name. or to any other devices with a similar name. anyone or anything else with similar names. Monster Man and his partner Kid Monstro were the lead characters in the superhero television series Monster Man, produced by Ted Silverberg and aired on ABC. They do not exist in the Marvel Universe other than as television characters. 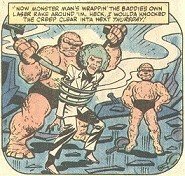 Both Monster Man and Kid Monstro had superpowers similar to those of Ben Grimm, the Thing. They drove a vehicle named the Monstermobile. Their known enemies included Captain Chlorophyll and the Lethal Legumes from Planet Twilo. Captain Chlorophyll was attempting to turn the world green before Monster Man stopped him, wrapping his own laser rake around him. 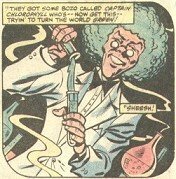 The nature of his powers and abilities are unrevealed, but at the very least he appears to be a chemical genius. The Legumes were, as the Thing put it, "Gun-totin' veggies." The costumes of the Lethal Legumes were animated by Xemnu the Titan, and fought the Thing while he was on the Monster Man set. Professor Frankheimer is an older gentleman, probably of German extraction (based on his accent). He is the inventor of the Holoflex Device, but he sold all the rights for the device to Ted Silverberg for $5000. The Holoflex Device can see through time and space. It is designed to project holographic representations of what it views, but when its experimental circuits overheated, it actually physically brought over the items it was viewing. Silverberg's Holoflex Device was smashed by a dinosaur which it had transported to our time.